The furniture in your home plays a large role in the overall feel of your home, as well as its aesthetics. 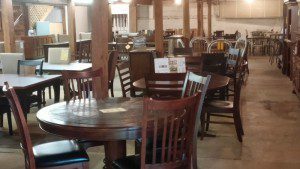 If you are looking for a furniture store in the Mooresville, North Carolina area that has a wide selection of high-quality pieces at a discounted price, turn to us at Brawley Furniture. We are a family company that has been in business since 1967. We are dedicated to carrying furniture from quality brands, like Crossroads Furniture, Artisan Home Furniture, Riverside, CMI, Timmerman, and Furniture Classics. We house all of our pieces in our extensive showroom and have added 20,000 more square feet of showroom space since we first opened our doors nearly 50 years ago. We will provide you with as little or as much service as you need during the selection process. One of the main reasons why you should come to our furniture store for all of your home furnishing needs is because we are dedicated to saving you money. By forming relationships with the trusted manufacturers we work with, we are able to eliminate the middle man, which can save you hundreds on new furniture pieces for your home. At Brawley Furniture, we are excited to help you furnish your home with some of our fine pieces. Stop by our furniture store today, or give us a call to find out more about the reputable brands of furniture we carry.